California’s Yosemite National Park welcomes millions of visitors each year—drawn to its dramatic waterfalls, giant sequoias, abundant wildlife, and awe-inspiring cliffs, like Half Dome and El Capitan. 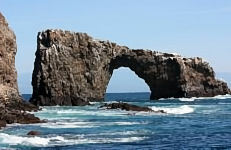 Five of the eight Channel Islands are protected in Channel Islands National Park, and half of the park’s area is underwater. The islands have a unique Mediterranean ecosystem. They are home to over 2,000 species of land plants and animals, and 145 are unique to this area. The islands were originally settled by the Chumash people. 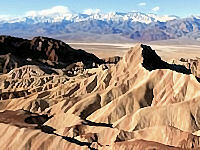 Death Valley National Park is the hottest, lowest, and driest place in the United States. There are canyons, colorful badlands, sand dunes, mountains, and over 1000 species of plants in this garden on a fault line. Further geologic points of interest are salt flats, springs, and buttes. 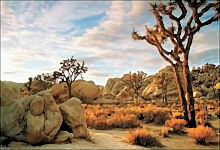 Joshua Tree National Park covers parts of the Colorado and Mojave Deserts and the Little San Bernardino Mountains. Across great elevation changes are sand dunes, dry lakes, rugged mountains, and granite monoliths. And, of course, this is the home of the distinctive Joshua tree. King Canyon National Park is home to several Giant sequoia groves and the General Grant Tree, the world’s second largest tree. This park also has part of the Kings River, site of the granite Kings Canyon, and San Joaquin River, as well as the Boyden Cave. 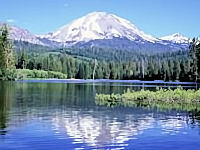 Lassen Volcanic National Park is named after Lassen Peak, the largest plug dome volcano in the world, which is joined by all three other types of volcanoes in this park: shield, cinder dome, and composite. Other than the volcano, which last erupted in 1915, the park has hydrothermal areas, including fumaroles, boiling pools, and steaming ground heated by molten rock under the peak. Redwood National Park and the co-managed state parks protect almost half of all remaining Coastal Redwoods, the tallest trees on Earth. There are three large river systems in this very seismically active area, and the 37 miles (60 km) of protected coastline have tide pools and seastacks. 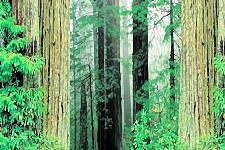 The prairie, estuary, coast, river, and forest ecosystems have varied animal and plant species. 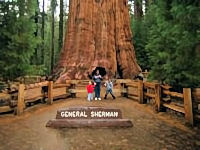 Sequoia National Park protects the Giant Forest, which has the world’s largest tree, General Sherman, as well as four of the next nine largest trees. 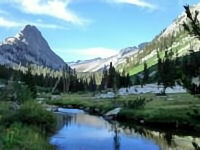 It also has over 240 caves, the tallest mountain in the lower 48 states, Mount Whitney, and the granite dome Moro Rock. 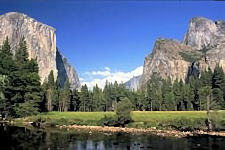 Yosemite National Park has towering cliffs, waterfalls, and sequoias in a diverse area of geology and hydrology. Half Dome and El Capitan rise from the central glacier-formed Yosemite Valley, as does Yosemite Falls, North America’s tallest waterfall. Three Giant Sequoia groves and vast wilderness are home to diverse wildlife. Channel Islands National Park is made up of five ecologically rich islands off the Southern California coast and their surrounding one mile of the ocean. Accessible by boat or plane, the Channel Islands are rarely crowded, but peak times are June–August. The climate is mild year-round. Swimming, snorkeling, diving, kayaking and whale-watching (blue and humpback) are common activities June–September. A world of extremes, Death Valley National Park is the nation’s driest, hottest and lowest place, but also features mountains over 11,000 feet high that experience below-zero weather and snow, as well as colorful badlands, sand dunes and canyons. Its dramatic mountains, valleys and a world of extremes. Death Valley is the nation’s driest, hottest and lowest place, but also features mountains over 11,000 feet high that experience below-zero weather and snow, as well as colorful badlands, sand dunes and canyons.